18 Oct 2018 --- Almonds have retained the number one spot for nut introductions in Europe, according to the latest Innova Market Insights data. 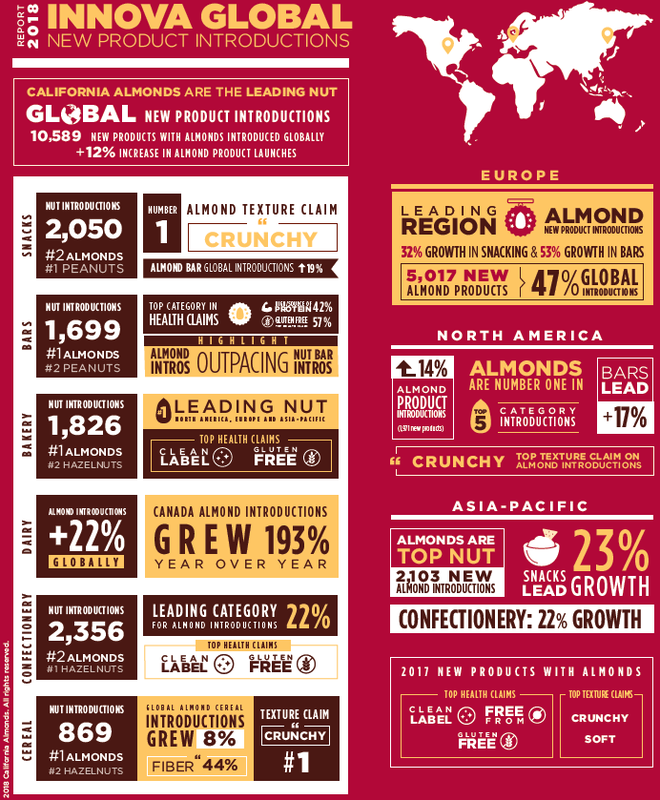 With a 47 percent share of global almond product introductions, the region leads globally for the eleventh year running. Europe as a whole saw over 5,000 new introductions with almonds – a 14 percent increase on the previous year. Germany, France and the UK follow the US as the top leading countries in Europe with 2,414 new almond products introductions collectively in 2017. This is the third consecutive year that almonds have taken the top spot in Europe. Almond introductions in the snacking and bars categories are on the rise, with growth in the snacking category up by 32 percent, and the bars sector up by 53 percent. Almond introductions grew in four out of the five key categories for almonds worldwide, with confectionery top of the category in the EU, making up 27 percent. The demand for almonds can also be attributed to their role as natural, nutrient-rich ingredients with appealing taste and crunch and extensive versatility as well as their consistently safe, stable supply. have taken the top spot in Europe. “As consumers seek out products that offer on-the-go, clean label, convenience and nutrition without sacrificing on taste, manufacturers must identify ingredients to stand out in competitive categories,” says Dariela Roffe-Rackind, Director Europe & Global Public Relations. “It’s also really encouraging to see Europe continuing to drive innovation in new product introductions, as well as playing such a progressive role on a global stage,” she adds. Innova Market Insights’ Global New Products Report also highlighted the top claims used on the packaging of products with almonds globally, noting that “gluten-free” was the top claim led (24 percent). Following trends and consumer demands for clean label products, claims of “no additives/preservatives” were the second most used on almond product introductions globally, communicated on 15 percent of almond products. In a nod to almonds’ well-known texture, “crunchy” was used as a descriptor significantly more frequently than other texture claims on almond products. 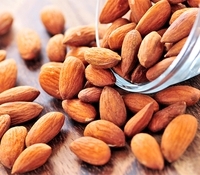 Ongoing market demand for almond inclusions in salty and savory snacks has expanded, according to the Almond Board of California, with growth drivers such as the rising awareness of the health attributes of almonds, the variety of available forms, demand for global flavor profiles and market advances that have allowed for the development of new coatings and flavor systems. Speaking previously to FoodIngredientsFirst, Roffe-Rackind adds: “The range of savory snacks featuring almonds continues to widen beyond traditional raw or salted nuts to include smoked and caramelized variants that offer limitless potential.” She was also featured in a recent supplier interview compilation in The World of Food Ingredients, where she noted how almonds can fit within the plant-based snacking trend. Almonds are one of the few natural ingredients that meet the diverse needs of product manufacturers, with appealing taste, texture, versatility and nutritional benefits. They continue to be included in NPD launches across a wide variety of sectors. You can read more on almonds and the snacking category here.